From the publican’s front room to the public house. It is said that the early pubs in our villages were the front rooms of small village houses and cottages. While the men were mainly out in the fields working the land women began brewing in the back of their cottages and after work they would welcome back the men with the offer of a pint of ale, probably a dark one. They would go ‘out back’ to draw the pint and bring it through to their main room, that in later times when licensing was introduced became a public house. Between 1650 and 1777 in the West Riding of Yorkshire it is recorded that 14% of women were licencees. Labourers took out licenses as well as mariners, horse breakers, bakers, tailors, shoemakers and farmers who would also set up public houses in the 19 century. Where the publican had another job his wife ran the pub. Marrying a women with experience in the trade was a good move. In 1891 in Easingwold 7 of 16 pubs had publicans with other jobs but in urban areas this declined later. In the census of 1851, 3434 publicans were farmers. 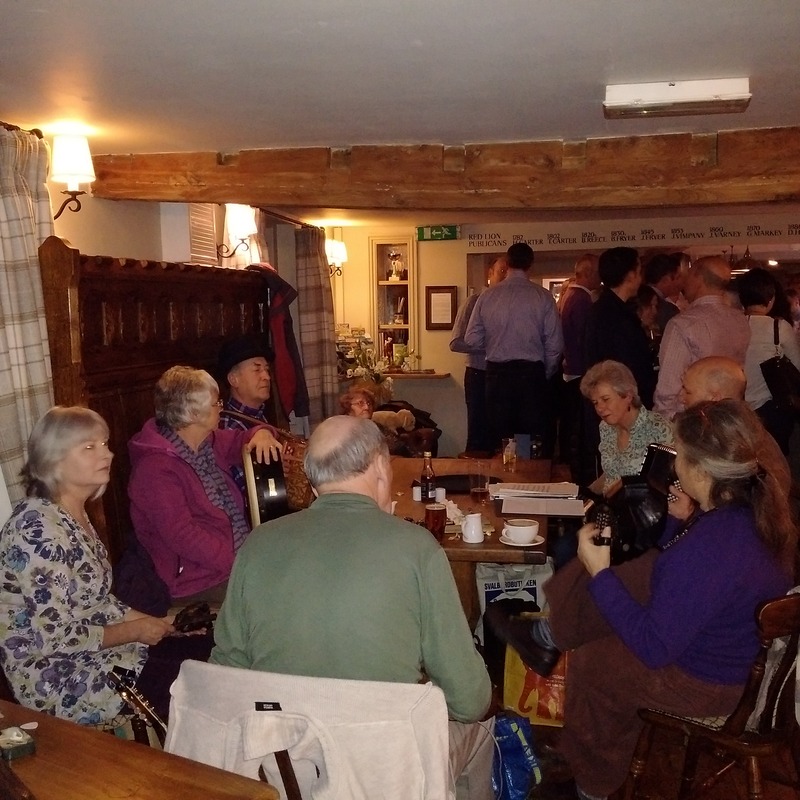 This brief picture shows how the origin of the village main bar has been in the past described as the publican’s front room and there is no doubt that a number of ‘front rooms’ were opened up to the public and villagers used the front room of the publican they liked or with whom they had good relations. If these relations deteriorated at any time drinkers would move on to another ‘front room’ in the village. An 1830 act of parliament even allowed weaker beer for children, women and servants that could be sold without a licence as they forbade the sale of spirits to under 16s. Public directories show that in Sheepscombe Henry Wakefield was a beer retailer from 1868 to 1879 but they don’t say where, although it was probably at the Plough. Richard Boulton and his wife Eliza were still at the Butchers Arms in 1871 and 1881. In 1885, Robert Williams, blacksmith was at the Crown and by 1889, Edwin’s brother, Frederick Halliday was the innkeeper at The Plough. In 1891 all three innkeepers had another trade; Edwin was a mason; Frederick was a mechanic, and the next landlord of the Crown, Henry Minchin who had arrived by 1889, was a shopkeeper and then a farm labourer. During the late 19th century village pubs became less used by women, particularly in rural areas where the Victorian culture disapproved of women and children in pubs, although later some bars were reserved for women. Then in 1908 Children Act banned under 14s in all bars. However, in 1939 both the Butchers Arms and the Plough in Sheepscombe were being run by women with Mrs Sollars at the Plough and Sophia Halliday at the Butchers Arms. Before long, Bill and Betty Halliday would take over the licence. Bill (Albert Frederick) was the son of Sophia and Joe and he remained at the Butchers Arms until the 1970s. He was the last of the line. 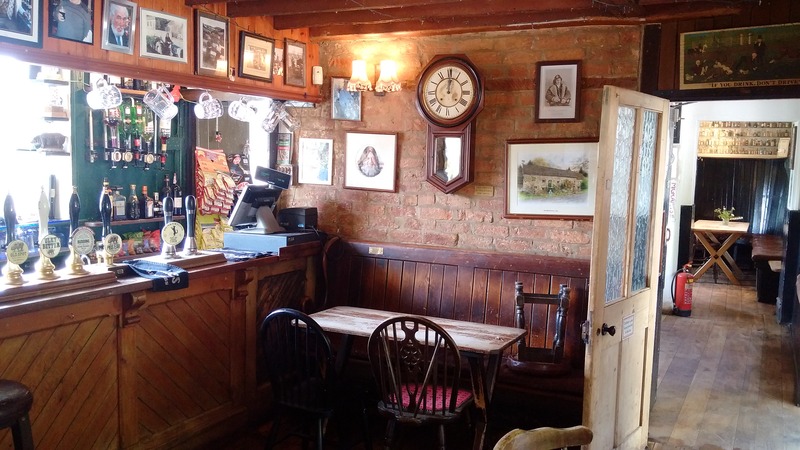 The culture of open front rooms, for mainly men, persisted up until the post war years, for example Painswick had something like 12 pubs up to the 1980/90s and Sheepscombe had a number of public front rooms. In contemporary times many pubs have closed – 13 a week across the country – and the survival of the English village pub is precarious. We now only have one pub in our village of Sheepscombe, similar to the villages of Arlingham, Horsley, Miserden and Slad which have been researched in a recent book by the first author, (Jeffrey 2018). In order to survive our village pubs have had to become destination pubs and at the same time become open to all ages, gender and classes. They are no longer a publican’s front room and they are much more a place that seeks ‘customers’ from across the county, as well as regulars, in order to gain enough income to survive. Regulars, dogs, children, county and global visitor, blow-ins and clubs have now taken ownership of our village pubs. The regulars call the pub ‘my local’ whether it is actually local to them or not. They often command a specific space in the pub and have been seen moving chairs to suit their physical peculiarities. They are quick to spot when their ‘plot’ becomes available and leap across the bar or into another part of the pub to take control of their place. The bar itself also attracts regulars who stand or sit on bar stools. They take ownership of this central part of the pub, like the captains on the bridge of a ship. Their ownership is made clear by the intimate way they converse with the bar staff and other regulars who enter and join them greeting each other warmly and often loudly and sometimes with intimate hugs and kisses. They often form a semi-circle in front of the bar making it clear to the more casual visitor that this is their pub and the managers or owners join them from time to time emphasising their ownership. Some stand with elbows on the bar and chat to other regulars across the bar space who may be sitting in their favourite seats away from the bar and bad language is much more prevalent. The pub for these regulars is their ‘third place’, they regularly inhabit alongside home and work. Children are now allowed in all parts of most pubs and they express ownership by clambering on to foot rails to see over the bar and occasionally order drinks; sometimes using the whole area as a playground. 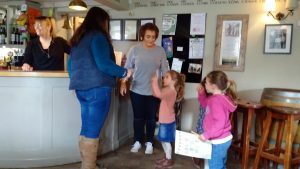 Toddlers are often allowed to wander round the bar from time to time, followed at a distance by a parent, waving and saying hello to all and sundry and everyone engages them as do the bar staff while carrying hot plates. One enterprising youngster took control of a bar space by parking her dolls buggy in front of an unlit fire while the whole family sit down to Sunday lunch. She ministered to her charges from time to time bringing them to the table for her mother to caress as the family conversation continued. They open up their gaming machines at the dinner table and take ownership of the space by allowing strange chimes and voices to emanate from their tablets. 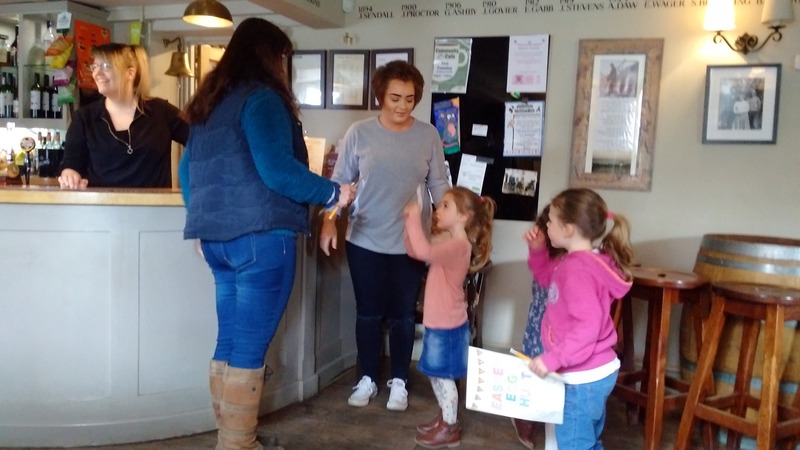 They are sometimes encouraged to join in the merry throng by playing noisy games with adults with the occasional shriek or quiet games such as chess and cards, seeing the pub as their third place alongside home and school. However, there has been a backlash to the opening of bar spaces to children. The Good Beer Guide published by CAMRA has a long article in the 2019 edition deprecating badly behaved children in our pubs and their parents for allowing them to spoil the enjoyment. The one of our local pubs, The Woolpack Slad does not allow children under 14 in the main bar, (1 of 4) nor do they allow dining in that bar; The Ale House in Stroud does not allow children in the pub after 7pm and insists on good behaviour, as does the Old Badger Inn at Eastington and there are no persons under 18 allowed in the main ‘pubic bar’ at the Bell Inn Frampton upon Severn. Dogs also own the spaces in a pub. They wander around under tables begging for food or clearing scraps from the floor or some sprawl their large frames flat on the floor grateful for the large space in front of the fire while staff who have welcomed them, gingerly stepping over them while delivering meals. Some are friends of the bar drinkers and add to the deepening mass attempting to get to the bar. Others make themselves at home by lying on the settees some pubs provide or sit neatly on low stools provided for customers. They are often welcomed, by the regulars, who pet and stroke them and the bar staff often provide treats for them and they can become so familiar with the engagement that on entry they immediately head for the space at the bar where they are used to being given treats. Often the dogs longest walk is 10 metres from the car to the pub where they too are regulars and take ownership of their spaces, some on soft beds provided by their owners so they can lie on them to make them feel even more at home. 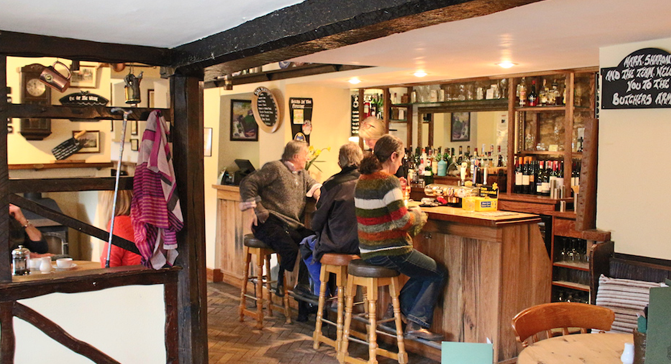 This pub represents, for the visitor, the value of being able to eat in a highly prized village pub which sits within a cluster of ancient stone cottages, accessed by narrow lanes and rural features that make the visit a whole experience. Visitors can sit in an environment, which dates back up to 500 years ago, and soak up the history of the pub and the village through the artefacts and pictures crammed together on every wall in the pub and evokes an idyllic rural past to imbibe. These are occasional visitors who rent a space for a couple of hours as they reserve ‘the table by the window’ and have been heard to complain about being given ‘a table in the back’ instead of being in the main bar. They take ownership of their space as a group and often appear oblivious of others as they talk animatedly about the intimate details of their lives which can be heard across the small space of our country pubs. Nevertheless they provide a vital income for the village pub which would not survive otherwise. 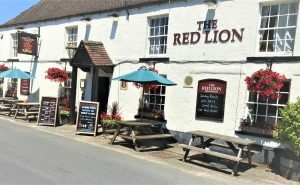 Most village pubs have social media visibility and seek local and national awards to encourage more trips to their public space. Saturday and Sunday lunches are fully booked in popular destination pub such as the Butchers Arms; holidaymakers ‘blow-in’ during the week as well and local town and county parties celebrate in them during the winter to aid survival. Pubs today, as they probably did in the past provide the settings where individuals or groups of people start initiatives that generate positive outcomes for the community or whole society, such as volunteering and charity activities, or a channelling of passions and interests into a more structured effort, such as a social club or sports team. On quiet nights in one of our pubs, locally, there are poker games [for drink tokens of course], a regular weekly folk club for the village and if Saturday is quiet, out comes the Karaoke. The Butchers Arms Sheepscombe hosts local clubs such as a literary club offers, charity events, special events, regular pub quizzes and advertises local walks. A pub today is home to: the kennel club, the knitting circle, the literary circle, music clubs, sports clubs, religious events such as Carol singing and friendly societies. They are also today: a children’s playground, a job centre, an epicurean centre, an arts centre, an historical archive, a library, an entertainment centre, a social club, a games centre and a haven. 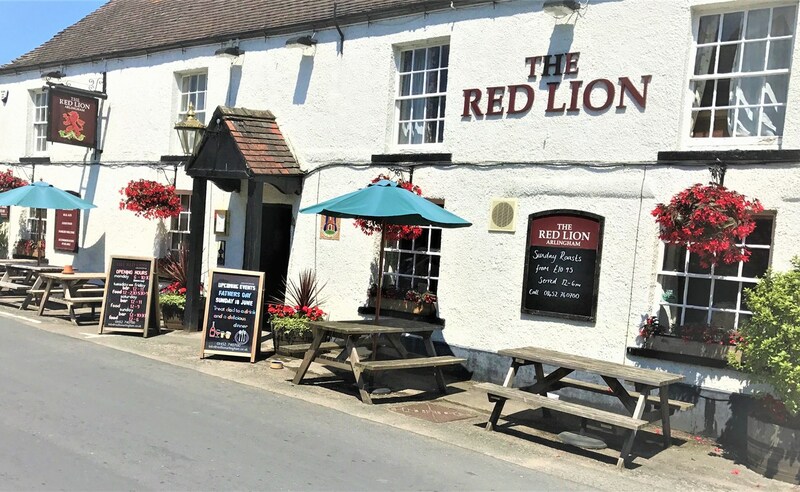 They are an infinite resource for locals, regulars, villagers and the publicans who manage them and provide an added value in terms of the emotional and spiritual connections for their members. The village pub has evolved from a front room to a major public space that the pub is no more the publican’s front room; a space and a place where they once determined the culture and style of the pub. The owners and managers of our village pubs have created a truly public house where they have less control over the space they own or rent than they might have done in the past in order to solve the problem of making a pub pay in small communities but also act as that third place after home and work, where human interaction and social welfare is generated maintaining their role in providing that third place for the village community. Some may deprecate the loss of control of these public spaces by publicans to customer dominance but they reflect the breakdown of limits on access to public spaces across gender and generations and reflect the necessity of publicans to survive. We live in a culture where alcohol is more available from supermarkets at low prices and where many families now live in only two places, work and home, where access to a variety of entertainment is now available through digital technology and it is cheaper to entertain at home. The public house has reached its zenith in that all are welcome and all behaviours are tolerated. This may be the price we pay for more equality and the survival of our third places but some may hark back to a time when the publican determined the culture of the open spaces and did not have to acquiesce power to the populace. 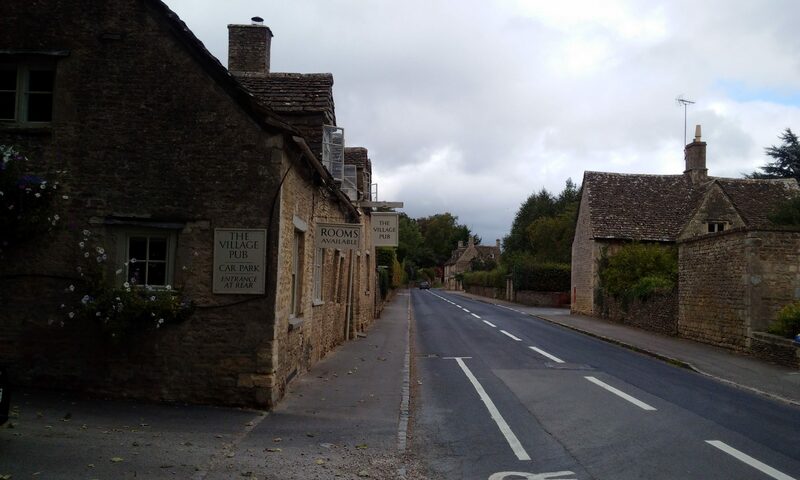 (The historical material concerning Sheepscombe Village has been contributed by Elisabeth Skinner, author of a History of Sheepscombe Village).